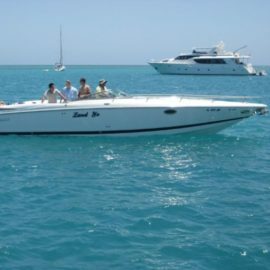 2010 Cobalt 272 w/146 freshwater hours. Single owner, stored under cover on lift when not in dry storage. Interior and exterior in excellent condition. Includes bimini, stereo, head, dual batteries with perko switch and swim ladder. Triple axle trailer included. 375hp 8.1 Volvo Gi big block with volvo dp-s outdrive. Engine hour histogram shows 62hrs are just idling. Snap-in carpet is included and hasn’t been used in a few years so is still in good condition. No major damage to hull, and gelcoat is still nice and glossy. Props are in excellent condition. No major tears in any of the seats and the vinyl is still soft. Everything works except the transom stereo remote due to replacing the head unit a while back. Trailer tires and batteries are newish. Oil change is fresh and raw water pump impeller has zero hours on it. Boat is ready for the summer. Clean, clear title in hand. Very motivated to sell and open to offers! Please contact Brandon @ five 1 two eight zero 8 8 four 2 eight if you have any questions. Cheers! +$68k NADA, Buy it now $59500 or best offer. Must Sell ASAP!! !